*For Oprah Winfrey’s November issue of O, The Oprah Magazine, out Oct. 9, the TV titan sat down with President Barack Obama and First Lady Michelle to talk about their 20 years of marriage. 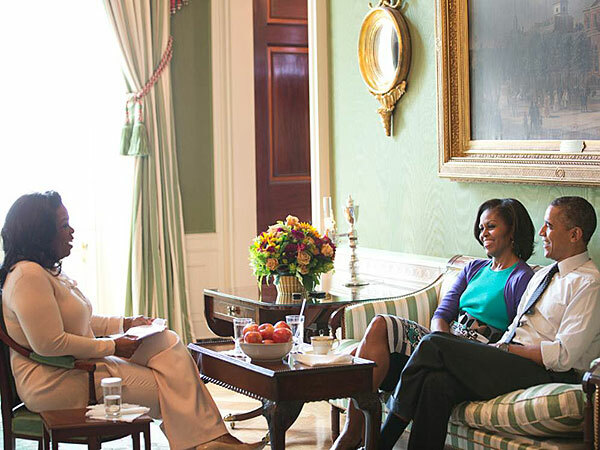 “When you’re under all of these pressures, to come home every single night … and have Michelle and the girls there … they are my balance and keep me grounded, and that’s truer now than it’s ever been,” the President tells Winfrey. Michelle adds, they also try not to sweat the small stuff. President Obama is spending a large part of his anniversary today gearing up for tonight’s first presidential debate, but he found time to acknowledge the important milestone in his marriage. “Twenty years ago today, I married the love of my life and my best friend. Happy anniversary, Michelle,” Obama Tweeted. Oh so…you cain’t “support” him, but want him in yo mag!?? WTF kinda BS is…DAT!!?? SMH at “Pearl Bailey”.